In the former Ditcharo’s space on Carondelet Street, Justin Devillier’s latest project, Balise, is nearing completion. It takes its name from La Balise, a pioneering French settlement that guarded the mouth of the Mississippi River in the rough and tumble early days of European settlement. And like La Balise, Devillier is an entrepreneur who has staked a claim in a difficult business. But despite his relative youth – he’s 33 – Devillier is already an industry veteran. He and his wife Mia own a majority interest in La Petite Grocery, the Magazine Street restaurant where he has honed his skills over the past 10 years and which regularly ends up on short lists of New Orleans best restaurants. His is an interesting case – a young guy in an era of media that glamorizes chefs but also one who legitimately rose through the ranks rather than culinary school. Fast-forward a few years and Devillier was on the fence regarding culinary school, unsure of whether that was the route to take. He reached out to a contact at the American Culinary Federation who gave him some practical advice: get out there, put your head down and work in kitchens for chefs that you admire. You are going to learn all the things you would learn in culinary school and probably faster. And you’ll get paid to do it rather than paying for it. “It was good advice and looking back I don’t have any regrets,” Devillier says. What followed next was a series of gigs at some highly respected restaurants with some top-notch chefs. He had old French family roots in New Orleans as well as a job connection through Ralph Brennan’s restaurant group, and he moved here in 2003. He worked at Bacco, Stella! and also with Anne Kearny at Peristyle. In ’04 he joined the team at La Petite, and later helped to reopen it following Hurricane Katrina. When Anton Schulte, the executive chef at the time, left La Petite in ’07 to open Bistro Daisy, Devillier was offered the top job. “I took it even though I didn’t really know what I was doing,” he says. He didn’t just work in the kitchen, he worked with accountants and in all other aspects of management. “They allowed me to make mistakes that I learned from; it was a crash course in business management,” he recalls. He was all of 26 at the time. The experience fast-tracked both Devillier and his wife, setting the stage for their next endeavor. It has been a busy year for Devillier. 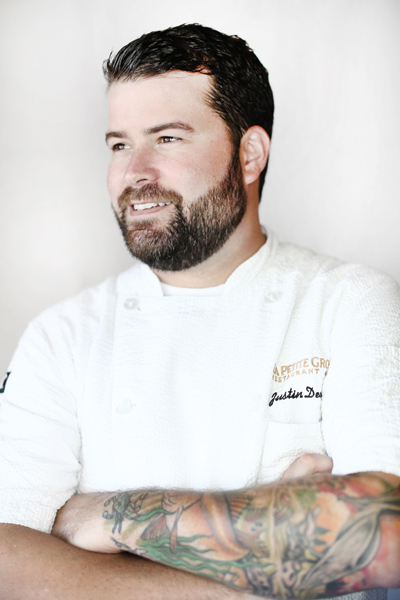 He was a nominee for the 2014 James Beard Award Best Chef South for the third year in a row. It also saw him celebrate the 10-year anniversary of La Petite Grocery. A stint on “Top Chef: New Orleans” not too long back thrust him into the national limelight. In addition, he and Mia are raising their two young daughters. So with all that he has going on right now, how is La Petite? A recent visit there demonstrated a restaurant in full stride. Smooth front of house operation and attentive service were noteworthy, especially considering that the special board ran about a third the length of the printed menu. Silky crab and cheese beignets yielded to a gentle bite, scented with scallions and a garlicky malt vinegar aioli. The first bite of braised short ribs tricked expectations when the seasonings yielded a flavor profile that was more Moroccan than French. The meal ended on Pastry Chef Bronwen Wyatt’s honey ice cream garnished with pumpkin seeds and Chantilly cream. In short, I can’t wait to get back to La Petite, but I also can’t wait for Balise. Balise (opening in 2015), 640 Carondelet St.